It started as an Old Navy men’s XXL T-shirt. The Cerulean Blue color caught my eye – and the $6 price tag sealed the deal. 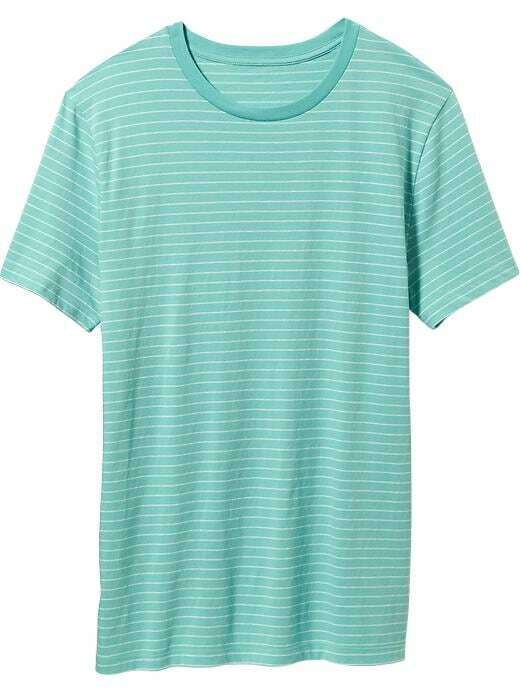 McCall’s 6747 was used for the Fit and Fabulous T-shirt. After cutting apart the XXL tee, there was more than enough fabric to add 1″ to the length of the t-shirt version (View A). The McCalls pattern has some shaping in its center back and side seams. To ensure a comfortable fit, bust darts were also added. The placket and neckline were sewn with scrap woven cottons from The Stash. As knits can be difficult to tame, I choose to exert my independence from pattern instructions and stitch the placket bands to the front prior to cutting the opening. 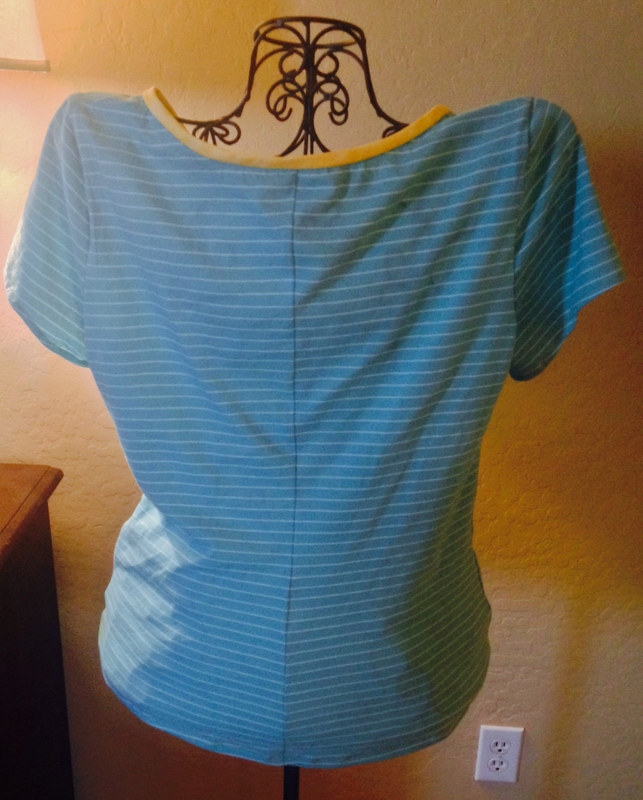 Shaped Back Seam – with matched stripes! But it was nothing stay stitching (slightly gathered) could not handle. Love the colors – and the comfort! Note about deconstructing ready-made garments: It is always surprising how “off center” and “off grain” the garment pieces will be. This is especially evident when working with striped fabric. Because of this, it is best to select the ready-made item several sizes larger than the intended finished garment. 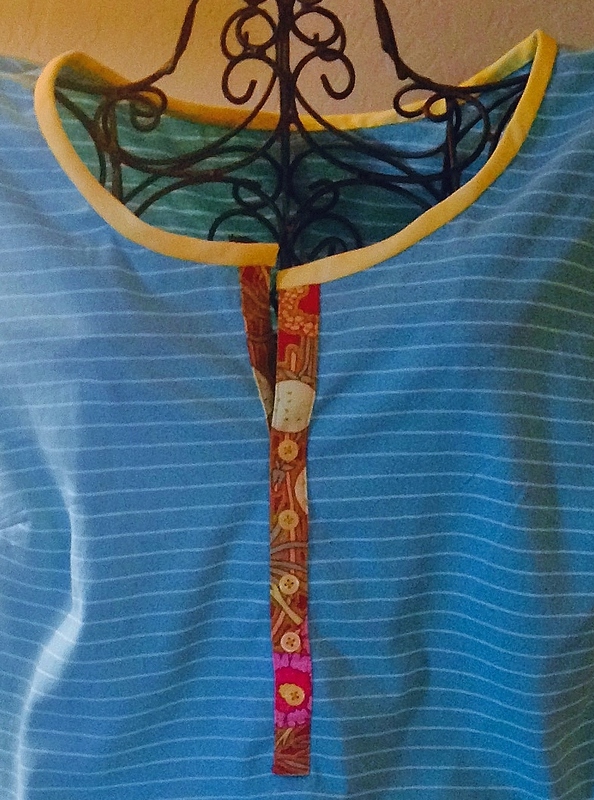 This entry was posted in Clothing, Repurpose, Scrap Couture, Sewing, Sewing for a Teenager, Stash Couture, T-shirt remake and tagged McCalls 6747, T-shirt fitting, T-shirt remake, T-shirt surgery. Bookmark the permalink. What a terrific idea! I have a couple of tees I bought because I liked the colors, but the make isn’t very good. The neckline ribbing sags and looks cheesy. They’ve been languishing in the bottom of my drawer, so what have I got to lose? Thanks for stopping by the Destashification Project. I always enjoy your Ravelry comments. (I edited your full Ravelry name, not sure how anonymous you might want to stay on the open web). I can’t recommend the t-shirt remake enough. Simple and very wearable. 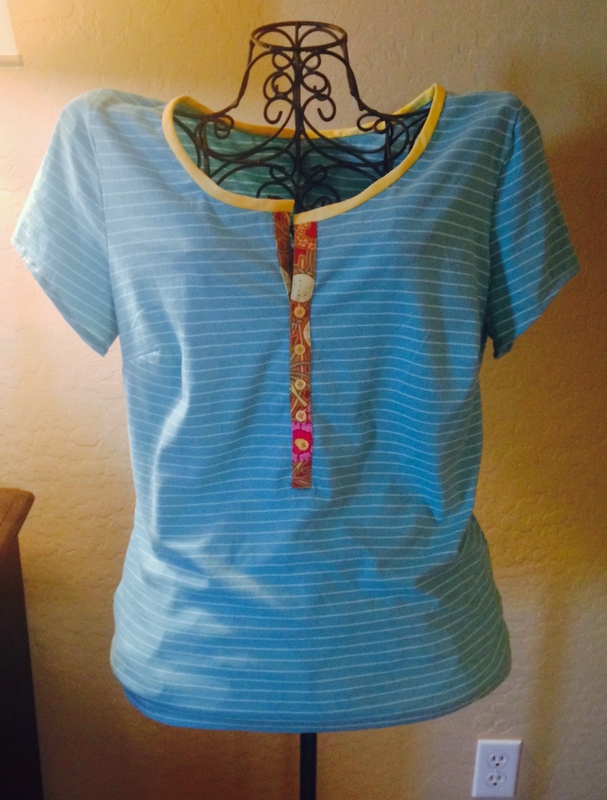 The neckline is perfect for highlighting small pieces of favorite fabric, or colors, and adding the darts improved the fit greatly! Please reply with your finished tees!